The way we conduct business. The King Report on Corporate Governance has influenced the development of corporate governance within the Group. The report provides a good foundation and useful guideline upon which the Group’s corporate governance is modelled upon. All employees within the Group have an important role to play in ensuring that the Group’s values and ethics are upheld. The values and principles espoused in this code are endorsed by the Group Five Board and the Executive Team. It is the foundation of how we conduct business internally and externally. The Transformation and Sustainability Committee (the Committee) has been entrusted by the Group Five Board with the responsibility to drive the implementation of the Group’s code of Conduct. We will adhere to the group’s Policies and Procedures and apply them fairly throughout the organisation. We will continue to pursue the group’s transformation objectives. All employees will operate within an agreed framework of authority and operating guidelines. We will ensure that our working practices conform to strict safety, health, environmental and quality standards. We will invest in the development of our employees and performance will be rewarded. We will act in a professional manner with each other and respect one another’s religious, ethnic and cultural backgrounds. We strive to maintain professional working relationships with all our business partners while ensuring that we maintain and foster a culture of team work. We strive to ensure that all our business partners not only fully understand but also adhere to our performance standards and requirements. In keeping with international best practice. We strive to ensure that we maintain professional working relationships with all our suppliers by ensuring that all transactions are subjects to the Group’s standard terms and conditions of procurement. These are made available to all our suppliers and in turn, all suppliers are expected to ensure adherence thereto. The Group’s confidential information in so far as it relates to the Group’s business strategies remains confidential at all times. We will consult with the communities where we operate on matters that may affect them. 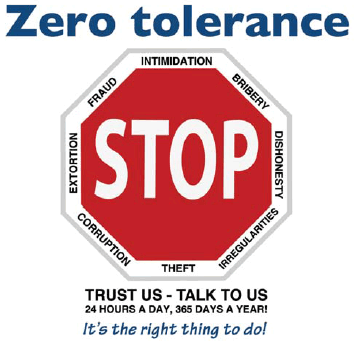 We will respect the values, culture and beliefs of the communities in which we operate. We will educate all staff on environmental issues. We will protect soils, water and air from damage through our operations as best we can. We will rehabilitate what we can. We will control emissions from our operations and will manage waste disposal under strict constraints. In a work environment where the achievement of an organisation’s goals is dependent on the combined efforts of all its people, it is imperative that all employees abide by a code of behaviour, which is supportive of the organisation’s objectives. 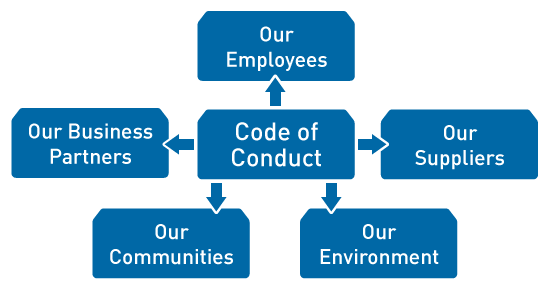 It is therefore important that we uphold our Code of Ethics through proper behaviour in the workplace and that we apply ourselves diligently to our jobs. Am I doing something that could possibly be illegal or seen to be illegal? Am I doing something that is dishonest or could be seen to be dishonest? Am I doing something that could be in conflict with the Code of Ethics? Am I doing something that internal or external people to our group could view as negative or be offended by it? If the answer to any of the above questions is “Yes”, then you should not proceed with your actions. Please discuss with your manager what you want to do to see if there is an ethical solution to your problem.